Delta MagnaTite Docking uses a powerful integrated magnet to set your pull down sprayer precisely into place and hold it there so it stays docked when not in use. Delta kitchen faucets with DIAMOND Seal Technology perform like new for life with a patented design which reduces leak points, is less hassle to install and lasts twice as long as the industry standard*. Kitchen sink faucets with Touch-Clean Spray Holes allow you to easily wipe away calcium and lime build-up with the touch of a finger. You can install with confidence, knowing that Delta kitchen faucets are backed by our Lifetime Limited Warranty. *Industry standard is based on ASME A112.18.1 of 500,000 cycles. Delta MagnaTite Docking uses a powerful integrated magnet to set your pull down sprayer precisely into place and hold it there so it stays docked when not in use. Delta SpotShield Technology helps to keep your kitchen faucet cleaner, longer by resisting water spots and fingerprints. Keep your space spotless with SpotShield Technology, available across a variety of finishes for the kitchen and bath. Delta kitchen faucets with DIAMOND Seal Technology perform like new for life with a patented design which reduces leak points, is less hassle to install and lasts twice as long as the industry standard*. Kitchen sink faucets with Touch-Clean Spray Holes allow you to easily wipe away calcium and lime build-up with the touch of a finger. You can install with confidence, knowing that Delta kitchen faucets are backed by our Lifetime Limited Warranty. *Industry standard is based on ASME A112.18.1 of 500,000 cycles. 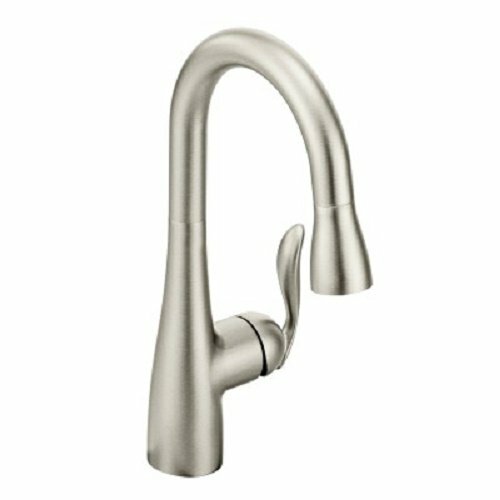 Expand the functionality of your kitchen with this Contemporary Single-Handle Bar Faucet in Arctic Stainless. 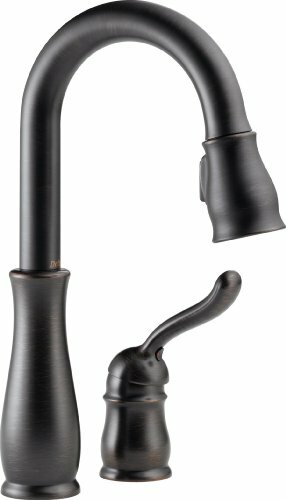 Bar-prep faucets go beyond the kitchen, to butler's pantries, morning kitchens and more. The high-arc spout makes filling pots, water bottles or rinsing your sink a breeze. Arctic Stainless chilly undertones and muted shine give a modern impression without limiting its versatility within transitional or even traditional decor. You can install with confidence, knowing that Delta kitchen faucets are backed by our Lifetime Limited Warranty. 9978-RB-DST Finish: Venetian Bronze Features: - Assembled dimensions: 5-13/16"in. H x 7-1/16"in. D x 9-7/8"in. W . -* MagnaTite docking keeps the kitchen pull-down spray wand firmly in place with a powerful integrated magnet, so it stays docked when not in use * DIAMOND Seal Technology features a valve embedded with diamonds to ensure like-new operation for the life of the faucet * Meets standards set by Americans with Disabilities Act * Touch-Clean spray holes allow for easy removal of hard water build-up * 2-hole 4-18 in. installation * High-arc pull-down spout swivels 360° * 1.8" gpm @ 6" psi, 6.8 L/min @ 414 kPa * Assembled dimensions: 14 in. H x 6-11/16"in. D x 5 in. 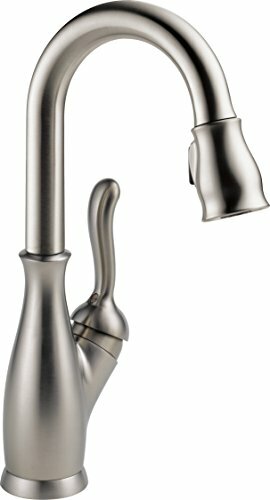 W * Lifetime Faucet and Finish Warranty. Product Type: -Bar faucets. Number of Installation Holes: -2. 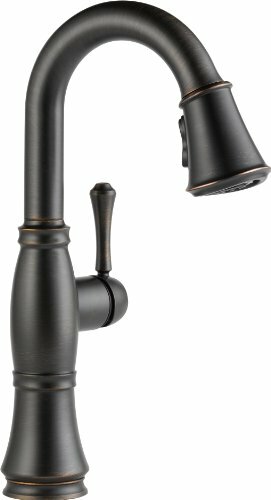 Dimensions: Overall Faucet Width: -2.38". Overall Faucet Height: -14". Overall Faucet Depth: -6.69". Spout Reach: -6.69". Spout Height: -7.44". Overall Product Weight: -19 lbs. 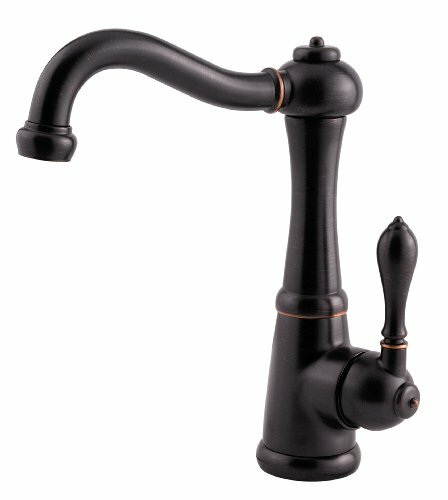 The marielle bar/entertainment faucet unites single control functionality with vintage French country-inspired design. Available with an optional deck plate, the marielle bar/prep faucet can be installed in 1 or 3-Hole sinks. Marielle is sure to bring new life to any kitchen, making coordinating the look of your kitchen easier than before. Delta Kitchen/Bar Trinsic Faucet Model: 1959LF Polished Chrome. 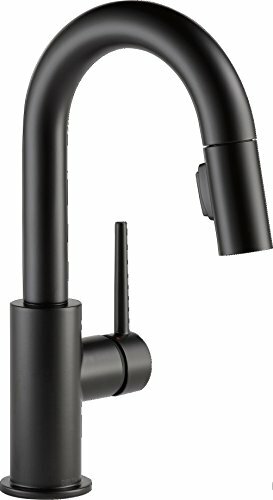 Want more Delta Kitchen Bar Faucets similar ideas? Try to explore these searches: 12 White Vinyl Flooring, Moog Alignment Kit, and Vintage 5 Light.